The first Chandler batrep since the restructure of things! I recently hit up a local steamroller going on in Salt Lake City; I don't get to play up there often but I got it on my calendar, made my lists, and made it happen. I was sad that for this event they weren't going to allow prereleases (as is proper procedure, but... was still sad about it) since it meant my Revelator and Champions of the Wall couldn't hit the table, but was going to be some good games anyway. I flip flopped on pairings a handful of times but eventually landed on a Thyra pair with Testament. Thyra was meant to be a bit of a catch all, and was basically just a variation on the version I was running at Warmachine Weekend to pull the Champions out since they weren't allowed. The Testament list was pretty standard, just Interdiction with two units of Errants, it was just there in case I ran into ghost fleet. Event had no Divide and Conquer so I was good to play Thyra all day if I wanted. My first opponent of the day was a Cygnar player (fun fact: this event was about half Cygnar) who I've played against a handful of times in the past while. He was running a Kraye list in Gravediggers which he thought was a bit experimental, and a Haley3 list. I forget what was in Haley3, I think Storm Division but I'm uncertain, as he dropped Kraye into my Thyra. Basically if you drop the Sunburst and Aiyana and Holt, then add two Champions of the Wall, that's the list I prefer to run. I'm building opponents lists a bit from memory so may not be perfect! Our scenario was Spread the Net. My opponent won our starting roll and opted to go first, I decided to take a side with a nice wall, hill, and cloud to hang out behind. The Trencher Commandos started off to my left, Infantry more central. His Centurion and one Hammersmith leaned more to the right, the other Hammersmith more left. Finn took the left as well, Kraye stood central, and everything else was more or less symmetrical, with an Express Team on either side and the Patrol Dog and Engineers in the center. This list doesn't have a ton of asymmetry to its deployment; Idrians AD in a straight line in front of my army. Blood of Martyrs took the left, the Sanctifier takes the right side. The Sunburst stood out on the right to take advantage of a long sight line and a hill. Both Allegiants took the far left, basically keeping away from the Infantry with CRA. The Paladins spread out across the whole line. Prey went onto the Centurion with my Idrians on the right, and his left-most Hammersmith with my Idrians on the left. Sadly I didn't take a picture of the first round (I missed a few rounds throughout this event), but mostly stuff ran. His Centurion and Hammersmith went towards my right, towards my zone, while the other Hammersmith took off to the left, using Tramples and Reposition to move a pretty good distance. His Infantry did a cautious advance to get dug in, and his Commandos ran and spread way out to threaten the area out in front of his rectangular zone. His Express Teams advanced, and one put a shot into one of my Idrians, killing him (activating Righteous Vengeance on Vilmon!) I knew I'd likely lose 1-2 Idrians to the Express Teams top of 1, I decided to deploy all the way up on my AD line anyway just to get a bit more threat onto the table. Luckily the angle he advanced the other team at didn't allow him a shot into a second one. One Trench Buster stood near Kraye, the other going over behind a forest to contest his flag for later. Vilmon leaps 3" forward! I don't have a whole lot of crazy stuff to do this turn, but there's a few shots to make. 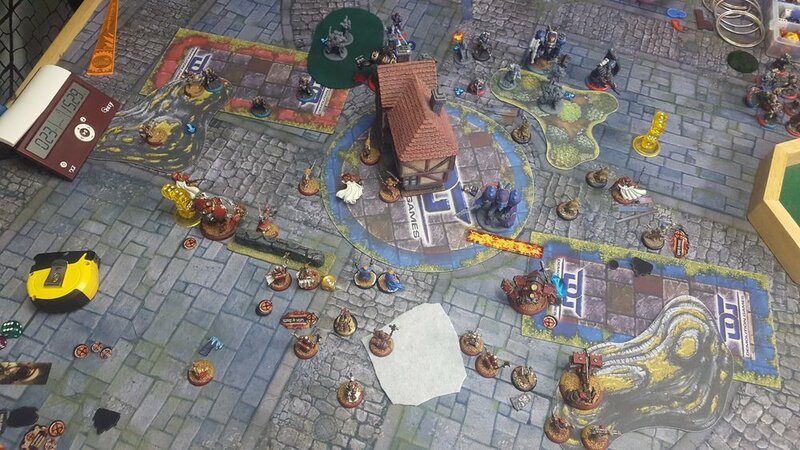 Idrians move up and spread out, and one CRA goes into his Express Team on the right, which misses. Both units pop their minifeat this turn. Thyra puts Silence of Death on the Idrians on the right, Occultation on the Idrians on the left, and Gates of Death on herself, advancing up cautiously. The Paladins all walk forward and Stone and Mortar, and the Allegiants on the left move up to just outside aiming range of the Express Team there and do Shifting Sands Stance. The Sunburst walks up onto a hill and puts a shot into his Infantry, getting a good deviation and lighting up three troopers and the Centurion. Aiyana and Holt ran up centrally. I pass the turn. Three trenchers burn to death, and the Centurion takes no damage from fire. The Patrol Dog moves up to the Occultated Idrians and barks to remove stealth. His Commandos on the left pop minifeat, advance, and start putting Scattergunner sprays and other shots into the Occultated Idrians. The Scattergunners with Finn nearby, should kill a ton of Idrians pretty trivially but... he misses way more than probability should allow and in the end only a few Idrians are dead, and one Allegiant got an advance due to a missed grenade on him. On the right, an Express Team does a point of damage to Vilmon and the remaining infantry spread out and drop clouds. The Centurion stays more or less still behind the clouds, contesting the zone and prepping to move forward next turn. Kraye stays near a Trench Buster and he passes the turn. Well, less Idrians died than should have. I drop Occultation, upkeep Silence of Death and Gates of Death. Thyra gets Harmonious Exaltation and charges a Commando in her range, casts Carnage, kills him and feats to scoot back over to the right and get more stuff into feat and Carnage. The Sunburst fires at one of the Infantry in the clouds, missing and deviating through on to some Engineers. My Idrians on the right teleport forward and walk into the cloud wall, killing all of the Infantry along that line and putting a CRA into the Centurion, doing a point of damage. On the left, between the Idrians and Allegiants, he's down to the Officer, a Scattergunner, and two regular Commandos. 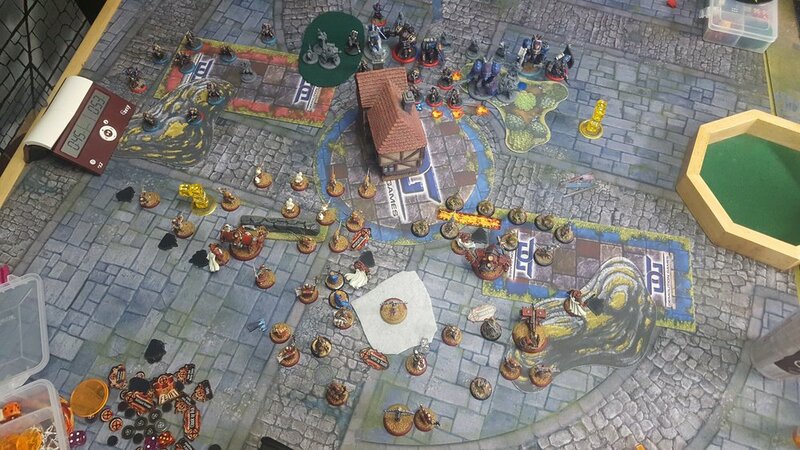 The Paladins all move and activate Stance again one standing on my flag to start scoring. The Sanctifier sets up in my zone but otherwise the 'jacks don't move up much, respecting Kraye's threat ranges. Aiyana and Holt posture to help threaten the Centurion next turn, and I pass the turn, scoring on my rectangular zone and my flag to make it 2-0. His plan this turn is pretty simple: kill 3-5 Idrians blocking the way for the Centurion to get to the Sanctifier. The couple Engineers on fire all die. Fire checks are not going well for him this game. Two Idrians are in melee with the Centurion, and a third is over on the right being a pain. Between the Engineers, an AOE from the Trench Buster, a shot from the Express Team, and some other attacks (it takes a handful), the three Idrians up front are dead. At this point, he needs one Idrian dead to clear his charge lane, and another dead to avoid a free strike. Finn spins up his gun for three shots and misses repeatedly, hitting with the third and killing an Idrian. Between every single model he's able to put over there, he's able to kill the Idrian that would get a free strike, but unable to kill the one actually standing in his way. Basically, needing things like 4-5 to hit, he barely hit anything at all. Even Kraye was forced to go over and start shooting at Idrians. Once the dust has settled, the Idrian is still standing there, defiant, right in the Centurion's way. Flustered and needing to get *anything* done, he has the Centurion charge into Vilmon over the wall, killing him. On the left his Commandos don't do much better, killing a couple Idrians. Blood of Martyrs is too far away for the Hammersmith to reach. Overall, nothing can get much of anything done. He contests my flag, but not my zone. I score to 3-0 at the end of his turn. Start of my turn I kill the contesting model around my flag and end my turn, going up to 5-0. I went in to this fight feeling reasonably advantaged, but my opponents dice utterly gave up on him basically from the second round. There were things he could have done as far as contesting in the last turn just to not instantly lose, but it wouldn't have really mattered since really that just translates to 'feed me his entire army.' Spread the Net is a hard fight anyway, and Thyra does this scenario quite well with this build due to how ridiculously far forward she can push the line of battle. If he had succeeded, he actually likely would have got BoM and the Sanctifier dead, which would have certainly made the fight interesting. The Centurion had taken about 8 damage between the CRA I put into him and a pretty nasty free strike he took charging Vilmon, and a Hammersmith will get beat up pretty bad by Thyra, I think with good use of Stranglehold and Kiss of Lyliss that's a spot I can make work but wouldn't have been ideal. I don't have much experience against Kraye or Gravediggers so... was good to get the game in. Keep an eye out for round 2!